Harvard econ shows how zip code is destiny, but how education can boost income. Harvard economist and MacArthur Genius grant winner Nadarajan "Raj" Chetty was at the last moment unable to be at the OLS in person. However, he appeared by video link, alongside his PowerPoint slides, and proved to be a great ad for telecommuting, saving time and money on air travel. His specialty is the field of public economics. Chetty talked about the current availability of the American Dream, acknowledging that there are different versions of it. He chose the one that said an American could grow up to have a better standard of living/earn more than their parents. "The American dream has faded. For kids born since 1980, it's a coin flip that they will earn more than their parents." Using a broad range of factors, Chetty's team used big data to tackle public policy questions. His first graph showed that the percentage of children attaining this dream has been declining steadily since the 1940s. The Opportunity Atlas (Opportunityatlas.org) is a collaboration between researchers at the Census Bureau, Harvard University and Brown University. They tracked 20 million kids to see how they climb the income ladder. They were assigned a location by zip code, and their average income measured again at age 35. A color-coded map of the US showed that the best upward mobility was in the Midwest, where some 35-year olds went on to make $45,700 while their parents had made $27,000. He zoomed in on Oregon and showed that in Portland it was more like $34,000. Surprisingly, eastern Oregon, which is often a shorthand for rural poverty, has higher levels of upward mobility than the Oregon coast. Southwest Oregon looked rather red on the map (low upward mobility) but when he zoomed in he found that Grants Pass and Roseburg had quite high (blue) upward mobility. "They're lands of opportunity," he said without irony. The reason upward mobility was not great in places like Charlotte, North Carolina, which has had great job growth, is because that state imports many talented people to work in those higher paying jobs. He showed how environment was important, not just jobs. 12 or 15. Their parent might be making $22,000 when they are two, but that kid would be making $32,000 in their mid-thirties. "Where you grow up really matters," he said. "Your childhood environment is more important than your adult one. And every extra year continues to help you." Chetty pointed out that there is a limit to this scalability of this force, because you can't move everyone. "So, investment is how to turn the red map blue." He did, however, show that in Seattle there was some success by educating people. "If you give them simple information, and housing vouchers, and drive them there to look around, and if you recruit landlords to lease to families with vouchers and give them insurance, and if you find them houses, it's incredibly helpful." All this can be done for families already receiving housing vouchers. It just uses them more efficiently, at no extra cost to the taxpayer. Good neighborhoods tended to have more two-parent families, which improved outcomes — especially for boys. These were places with "greater social capital, where someone will help you out if you're not doing well, like Eastern Oregon." 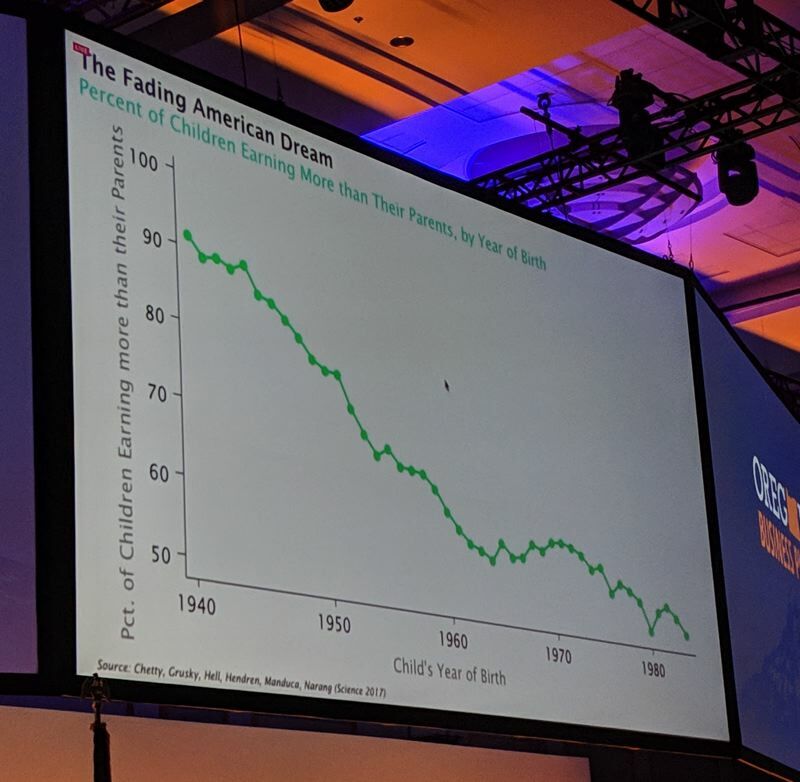 Chetty talked about CLIMB, or the Collegiate Leaders in Increasing MoBility, which tries to increase access to higher education for low-income students. He showed bar charts showing how the University of Oregon and Oregon State University have a lot of students with parents making high incomes. For instance, 56.5 percent of Duck folks make over $111,000 per year, but only 4.7 percent make less than $25,000 annually. 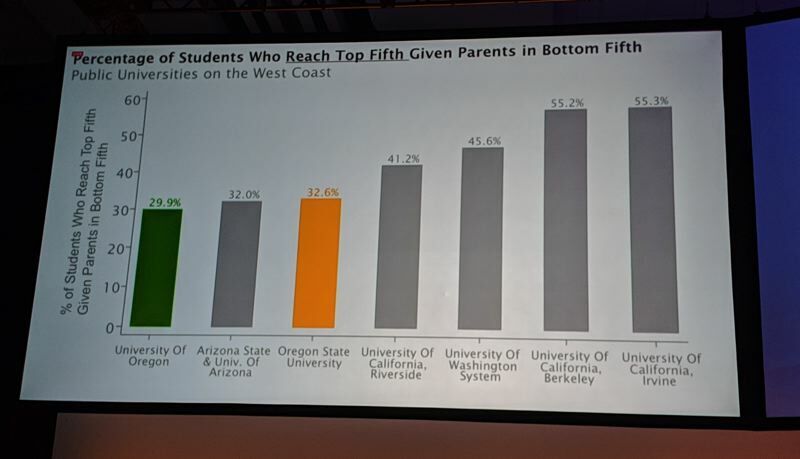 Other state schools such as the University of California at Irvine and Riverside, and Arizona State, have higher percentages of parents making low numbers. They looked at what 100 of such kids earn after college and came up with a mobility rate. Again the Oregon schools came in low on the scale. access to education? That's the challenge these people (CLIMB) are working on."